Upcoming are a couple of Pixelversity events associated around the International Cooperative Alliance (ICA) Global Research Conference that will take place next week in Finland, organised by University of Helsinki's Ruralia Institute, part of Mikkeli University Campus. 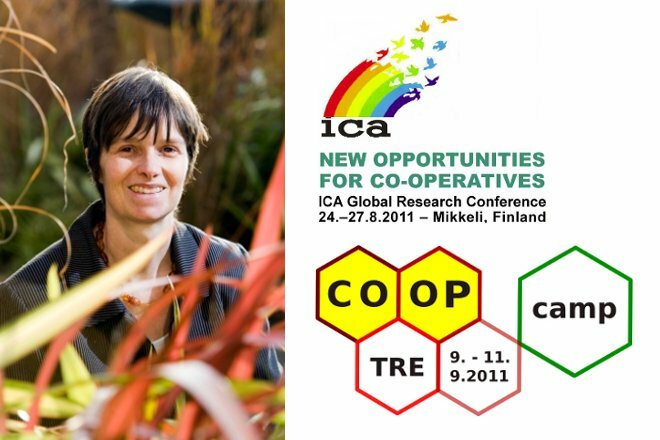 One is a presentation on Tuesday next week in Helsinki by Molly Scott Cato, a leading reader-writer and activist in Green Economics from the UK; Another is your chance to share and explain how you work with others -- online, offine -- or invite others to cooperate with you -- as part of Coop Camp on the second weekend of September. This will all be good preparation and awareness for next year's UN International Year of Cooperatives. More specific details in links above and text below. Firstly, in Helsinki on Tuesday 23.8. from 1730-1930, Welcome to a public presentation by Molly Scott Cato, leading authority on Green Economics and a part of the Transition movement for low-carbon lifestyle in the UK. This event will be introduced and hosted by Demos Helsinki in their office downtown. Cato is one of the keynote speakers in the Mikkeli conference. Pixelache member Andrew Paterson has been in dialogue with the local cooperative research scene since 2009 to explore ways of including the informal cultural and (online) networked cooperation experience that is witnessed in the Pixelache scene and network. During the conference in Mikkeli from 24-26.8, he will present the Pixelversity initiative to researchers in the ICA research conference in Mikkeli, within the context of the theme 'Multidisciplinary teaching and research on co-operatives'. Look out for a report following of the conference theme and other events from there. Lastly as a chance for you to contribute to learning about the experience of cooperation -- whether formal, informal, online or offline -- we invite you to take part in the first Coop Camp, in Finland, that will take place in Pispala-Tampere on the weekend of 9-10.9.. This event is organised in collaboration with Hirvitalo, and will be a 'barcamp/unconference' style event where you can contribute in an appropriate way. During this weekend, we will have a special guest keynote presenter: Franz Nahrada from Vienna, a key figure in the Global Village Network. Be in touch with the organisers & related facebook page if you are interested to attend.